1.1.The Hula Limited ("HULA") is committed to protecting and respecting your privacy. HULA's website is located at www.theHula.com ("Website") and is owned and operated by HULA. 1.3.HULA pledges to fully meet the requirements of the Personal Data (Privacy) Ordinance, Chapter 486 of the Laws of Hong Kong Special Administrative Region of the People's Republic of China ("Hong Kong") ("Ordinance"). In doing so, HULA will ensure compliance by its staff to the strictest standards of security and confidentiality in respect of all personal information and data submitted by users via the Website and HULA will not release such information to anyone without the prior consent of the relevant user(s) of the Website (whether registered or not) except to the authorized persons listed under Clause 4 below. (xvi)To be able to access your account on the Website. 2.2.HULA strives to only collect personal data which is necessary and adequate but not excessive in relation to the purposes set out herein above. If HULA requires the use of your personal data for a purpose other than those set out herein above, HULA may request your consent to the same. 2.3.If you are under the age of 18, you may not form legally binding contracts and as such cannot be a customer of HULA and/or a user of the services offered on the Website. Accordingly, the Website is not designed for persons who are minors and we do not knowingly collect information from minors. If we become aware that we inadvertently received personal information of a visitor who is a minor, we will delete the information from our records. 3.3.HULA does not link the Personal Data automatically collected in the above manner to any personally identifiable information. HULA generally uses such automatically collected Personal Data to estimate the audience size of the Website, gauge the popularity of various parts of the Website, track your movements and number of entries in HULA's promotional activities and special events, measure your traffic patterns, and administer the Website. Such automatically collected Personal Data will not be disclosed save and except in accordance with Clause 4 below. 3.4.Occasionally, HULA may also collect additional Personal Data from you in connection with surveys and/or special offers. Only duly authorised staff of HULA will be permitted to access your Personal Data, and HULA shall not release such Personal Data to any third parties save and except for the circumstances listed out under Clause 4 below. 4.1.HULA agrees to take all practicable steps to keep all you Personal Data confidential and/or undisclosed, subject to the following. (ix)Where HULA deems necessary in order to maintain and improve the services on the Websites. 4.3.You should take care when using social networking features of the Website since the information you choose to make available can be seen by other users in the selected group. HULA does not monitor the use of such features in the normal course of business although it reserves the right to do so at its discretion. 4.4.Personal Data collected via the Website is transferred, stored and processed in Hong Kong SAR. By using the Website, you are deemed to have agreed to, consented to and authorised HULA to disclose and/or transfer your Personal Data under the circumstances stated above, and to transfer information (including the Information) outside of your country. (b)Charitable or non-profit marking organizations. 5.2.HULA has implemented suitable measures to allow its members to "opt-out" of receiving such materials. 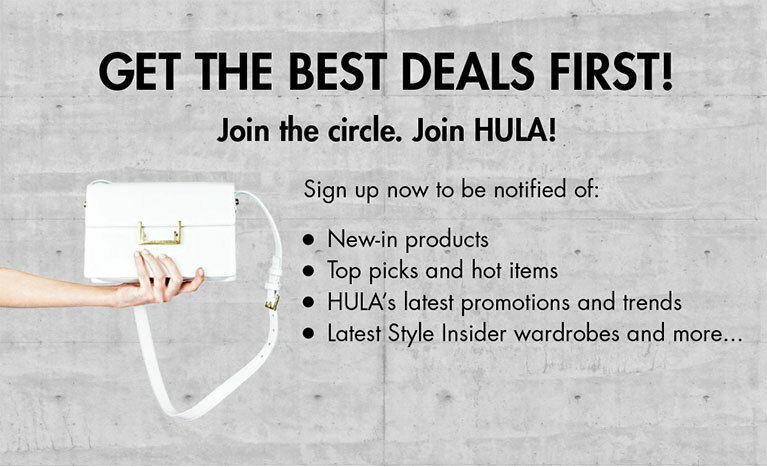 In this regard, you may, at any time, choose to sign up for or unsubscribe from receipt of such materials by logging into the registration or user account maintenance webpage, or by clicking on the automatic link appearing in each newsletter or message, or by emailing HULA's Customer Service Representative at: Hello@TheHula.com. Any such request should clearly state the details of Personal Data in respect of which the request is being made. Please note that after opting-out, you may still receive non-marketing messages, such as product updates and service notices as permitted under applicable local laws and regulations. 6.1.Under the Ordinance, every user is entitled to request access to or make amendments to his/her own Personal Data kept with HULA by logging into the registration or user account maintenance webpage, or by emailing HULA's Customer Service Representative at: Hello@TheHula.com. Any such request should also clearly state the details of Personal Data in respect of which the request is being made. (iv) to lodge a complaint about the processing of your personal data with your local data protection authority. 6.3. You may request access or make amendments to your own Personal Data kept with HULA by logging into the registration or user account maintenance webpage, or by emailing HULA's Customer Service Representative at: Hello@TheHula.com. Any such request should also clearly state the details of Personal Data in respect of which the request is being made. In the event that you wish to access or amend your Personal Data, HULA may request you to provide personal details in order to verify and confirm your identity. HULA will use its best endeavours to respond to your requests within 40 days of your request and will endeavour to do so wherever possible. 7.2.Any material you upload to the Website will be considered non-confidential and non-proprietary, and HULA has the right to use, copy, distribute and disclose to third parties any such material for any purpose. HULA also has the right to disclose your identity to any third party who is claiming that any material posted or uploaded by you to the Website constitutes a violation of their intellectual property rights, or of their right to privacy. 7.3.HULA will not be responsible or liable to any third party for the content or accuracy of any materials posted by you or any other user of the Website. 8.1.The Website may provide links to other websites, media platforms, or applications that are not owned or controlled by HULA. Personal Data from you may be collected on these other websites, media platforms, or applications when you visit them and make use of the services provided therein. You are reminded and acknowledge that when and where you decide to click on any advertisement or hyperlink on the Website which grants you access to other websites, media platforms, or applications, the protection of your Personal Data which is deemed to be private and confidential may be exposed in these other websites, media platforms, or applications. 9.1.The security of your Personal Data is important to HULA. HULA will always strive to ensure that your Personal Data will be protected against unauthorised access. HULA has implemented appropriate electronic and managerial measures in order to safeguard, protect and secure your Personal Data. 9.3.HULA uses third party payment gateway service providers to facilitate electronic transactions on the Website. Regarding sensitive information provided by you, such as credit card details for completing any electronic transactions, the web browser and third party payment gateway communicate such information using secure socket layer technology (SSL). 9.4.HULA follows generally accepted industry standards to protect the Personal Data submitted by you to the Website, both during transmission and once HULA receives it. However, no method of transmission over the internet or method of electronic storage is 100% secure. Therefore, while HULA strives to protect Personal Data against unauthorised access, HULA does not guarantee its absolute security. 10.1.Once HULA has obtained your Personal Data, it will be maintained securely in HULA's system. Subject to legal requirements, your Personal Data will be retained by HULA after deactivation of the relevant service until you request HULA in writing to erase your Personal Data from HULA's database or to terminate your membership of the Website.